I don't have my PSP anymore so not sure but VC2's DLC which is available on the PSP only has reviews on the PAL store. Same with The Sims 2. I'm guessing that those were reviewed with the PS3. In any case, PSP's Japan PS Store definitely doesn't have a rating function. I don't think it's as simple as "the brand is popular, therefore success". This particular game was similar to Animal Crossing from what I've heard. Dang, looks like Ace Attorney Dual Destinies won't be as big as Apollo Justice. Didn't it only do 60% or so last week? Obviously it's not gonna price collapse or anything, but just don't think it'll hold up as well. AA5 had better sellthrough, but AA4 had better second week. Did they ever have a BEST version of AA4? Garaph doesn't have it. Looking at all of the other AA games, a BEST release would help get more people to play the games. Yes it did, did around 100k. Garaph is a bit weird as it uses the Gyakuten Saiban 4 name for the original release and Apollo Justice for the BEST release. Silly me, I couldn't read lol. Nintendo wasn't playing with a full deck when they launched the Wii U. They are so lucky to have the 3DS alongside it. Disney did awesome! If the vita sales are declining to 15k next week and it keeps consistently selling at that rate, would that be ok for it to be sucessful for ist niche selling Claim? Yeah this is the most important thing. Have the improved sales and some success stories that are to be found on the Vita convinced enough developers to start building games for it even when they can't take the risk-free psv/ps3 approach? I mean by next holiday I assume japanese developers will move to the ps4 and those games will definitely not be multiplat with the Vita. Monster Hunter 4 (September 14) + Pokémon X / Y (October 12) + One Piece Unlimited World R (November 11) + Puzzle & Dragons Z (maybe December?) looks like a mighty combo for the last 3 and a half months of the year. I really wonder if anything will survive this. That is a good question =). Considering no new console launches this year in Japan, and those games listed above, it's seriously just going to be the 3DS selling in Japan lol. I think the 3DS is doing well in Japan, and games like Pikmin 3 and Lego City are (currently) holding on better than I expected. Let's see how Wii U sales go the rest of this year. Btw, why do people seem to like the famitsu sales over media create's? They seem to be pretty similar in general. One Piece 3DS is gonna make so much bank. Naruto 3DS is gonna make so much bank. PS4 could release this year. Famitsu includes download-numbers, so thats probably why. To be more precise (so people don't get confuse), they include download cards (I don't think anybody does them outside of Nintendo though). That's why Animal Crossing is so much higher in Famitsu for example. I wonder if the PS3 will be able to hit 10m LTD by the end of this year at this rate. You get exact numbers for Top 30 with Famitsu vs. only Top 20 for Media Create. You also get more updated LTD numbers with Famitsu, and there's more public historical data available for it. I like using Famitsu because it tends to lowball Nintendo hardware, so I can have "the minimum estimate" for however Nintendo ends up performing. I prefer under-tracked vs. over-tracked. However, both trackers are highly reputable and their numbers are fine either way. Most notably, Nintendo likes to use Media Create figures in their sales presentations, but that doesn't make Famitsu's any less worthwhile. "We've never used this size of a team and this amount of time to build a game before," he told Famitsu magazine, "and even so, this is the first time it's been so tough for me, especially towards the end of development. I suppose I'm getting what I deserved there." Longest Dev Time + Largest Staff = Definitely highest budget Platinum game ever, unless everyone took a massive pay cut. Yep, I can sense Kamiya's meltdown on twitter regarding sales. Hopefully this ends the notion that the game looks like an indie eShop title. It hurts me to say this because the game looks awesome but who at Nintendo thought it was a good idea to let this games budget get larger then Bayonetta's when its going to sell much less then Bayonetta. And they never really treated the game very well in the first place since it was announced on the GT post Nintendo conference show instead of during the press conference like it deserved. Finally crossing streams with the PS3 soon. With all due respect to Kamiya and co. it does veer towards looking like a downloadable title. It really doesn't. Unless you're talking extreme close-ups. I just watched the E3 trailer again. I don't mean so much the production values, and I'm sure it's packed with content. I'm not sure what it is about the aesthetic, but it strikes me more as something that one would expect as a downloadable title. Edit: Maybe it's the isometric perspective combined with a cartoon/comic artstyle. Wonder how much and what type of support Japanese devs will give the PS4 given where Japan's headed currently. Guess we'll see at TGS. I was looking at that same thing earlier. Should be two or three weeks: Hot Shots Golf 5 released in PS3's 37th week or so. I can see where you're coming from, don't get me wrong. Especially since this type of style has never really seen its way into the mainstream. I wish Kamiya all the best for Wonderful 101. I hope that he can come with a game some day that has worldwide appeal like Bayonetta and Devil May Cry. I think that Wonderful 101 concept was conceived entirely around the Wii U Gamepad. I think it uses the best use of Gamepad so far after Zombi U. Okay jokes aside, W101 is pretty close to release and it's still #320 on japanese Amazon. 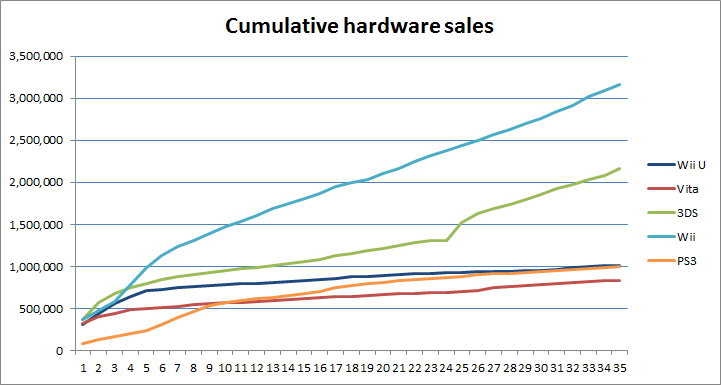 There are about one milion WiiU consoles sold in Japan and there isn't exactly that much to play on the system. The game looks nice and it's definitely something worth picking up if you have WiiU (especially considering the drought I mentioned). It's almost like Japan is repulsed by this title, which I don't completely understand (art direction problem is not valid as I see more sentai influence than western). I don't see the fuss about the title tbh. I've played it and it came across as a shallow fighting game. Yes there are many wonder weapons, but changing between them is hardly quick enough to allow combos. The idea is novel and the art style is good but the fighting system bored me and I only played half an hour. Maybe the setting was on easy who knows. It will bomb due to the lack of awareness and being a niche genre.Being on the WiiU only makes it worse. The direct may help though. Are the rest of the big titles for 2013 in Japan either 3DS or Wii U exclusive? I am probably missing something, plus we have TGS. 3DS is a good assumption, but Wii U is not. Is that silly Lightning game being released on 360 in Japan as well as PS3? Were people really saying that though?